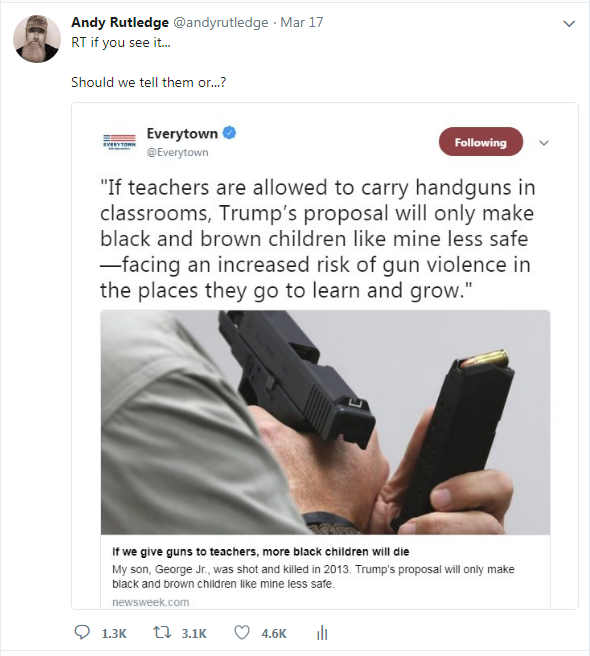 On Sunday, March 18 my @andyrutledge Twitter timeline began to blow up with views because of my post the previous day containing a screen capture of a tweet from the Everytown account, showing a photo they posted with bullets loaded backward in the magazine. I posted, “RT if you see it. Should we tell them, or…?” For obvious reasons of humor and schadenfreude, my post was retweeted many times that day. By the following day the post had gone rather viral and my account posts had received 100k impressions on the 18th and almost 600k impressions on the 19th alone. My account also received more than 500 new account followers just from the 18th to the 19th. Needless to say, this was exceptional activity and I was rather happy about the whole thing. Since I have never threatened anyone on Twitter or anywhere else, I know this to be 100% false. Yet Twitter did not and as yet has not shared any evidence or substance for why my account was killed. They have cited no specific post or posts that led to my suspension. They just killed it. By evidence I’m left with the clear fact that Twitter maliciously killed my original/namesake account, presumably because they disagree with my effective shaming of a proven-lying, anti-liberty, anti-safety, anti-firearms organization that happens to be a Twitter darling.